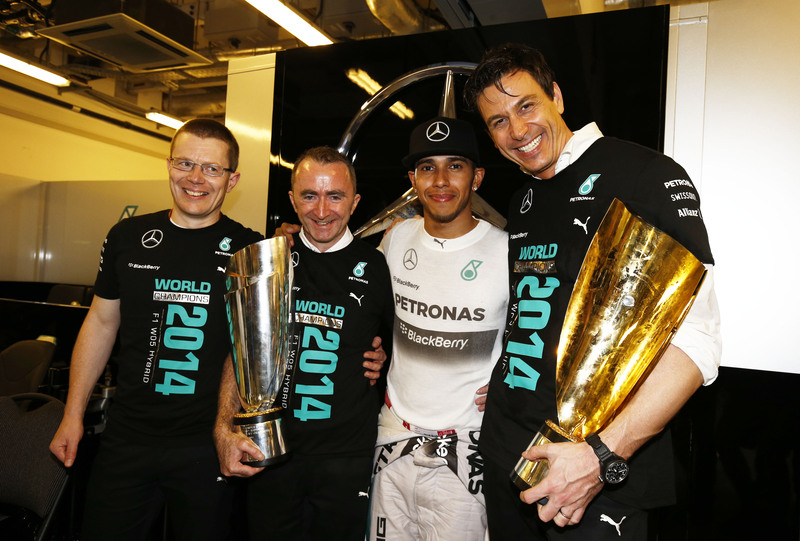 “It’s very hard to soak all this up,” exclaimed a clearly tired and exultant Lewis Hamilton. Following a nervous and tense Brazilian Grand Prix two weeks, ago, the Englishman went into this weekend’s double-points finale still as favourite, but also with plenty on ones mind. A champion now in Abu Dhabi, Hamilton’s words did not always flow easily. Sometimes they poured; others times they seemed like slow stutters eeping out, as the double-world champion checked himself. The 29-year-old has let his emotional state get the better of him before and has been burnt by criticism as a result, but now in the post-race press conference, the strengths, frailties and triumphs and losses were exposed. That is not necessarily a bad thing of course. Hamilton’s emotional reactions add so much flesh to his person. It devides opinion, drives conversation and occasionally arguments, and fuels the passionate. For a sport that so often is criticised for possessing sterile personalties, this can only be good for the sport. Meanwhile, Hamilton continued: “Niki [Lauda] was right, I didn’t sleep last night. I went to bed at about 1am and woke up at like 5am this morning and I went for a run […] and a massage and everything. Rosberg needed to win at the Yas Marina circuit – of that there is no doubt. Had Hamilton suffered another spin like he had at Interlagos, or had a first lap incident as he had at Spa-Francorchamps, or even a race ending mechanical issue as he had at Melbourne or Montreal, then the 50 points for the victory could have played into Rosberg’s hands. “Coming to the last race, knowing it’s double points, which… jeez… do you think it was a good idea? Didn’t feel like a good idea when we came into it. I’ll take the points though…” Yet a champion is declared over the course of a season and not a single race. Realistically Hamilton has performed the better of the two Mercedes driver’s this year and had he lost the title to a gimmick, then Formula One would only have been damaged. Unlike the youthful Hamilton who emerged in 2007, this champion is a far more reflective person and despite the fires lit by a UK media so often desperate for a story to flog trees and digitals figures. There is little doubt that Hamilton is beginning to hit his peak and that the Stevenage-native is only getting better. Of that, his rivals must contemplate, for as he becomes one of the sport’s elder statesmen, it is their futures that may be cast in shadows. Although occasionally clumsy, Hamilton rarely sprout words simply for the sake of it; there is far more to the man than that. Formula One supremo Bernie Ecclestone could do much to learn from Hamilton’s example. It is douybtful anyone would have said that following Hamilton’s first title in 2008, but then again, the Lewis Hamilton of 2014 is a very, very different animal – and far more potent too.